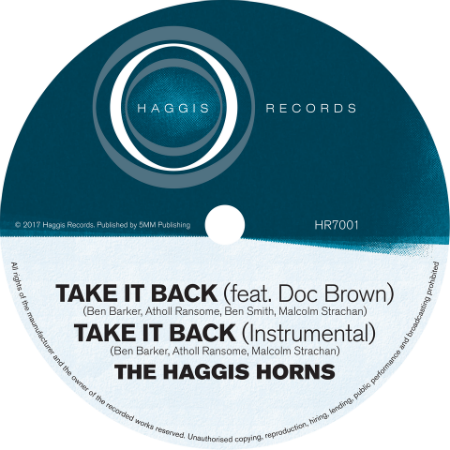 The Haggis Horns will release their fourth studio album in September 2017 and as a little teaser, they drop a summer single worldwide on June 9th, a feel good bouncing hip-hop/funk jam featuring guest UK MC/rapper Doc Brown. Think back to the dawn of hip-hop in the early 1980s when the first rap singles featured the Sugarhill Records house band laying down heavy funk grooves for MCs like The Furious Five and Treacherous 3 and you get the flavour. No-nonsense party hip-hop/funk for b-boys, soul sisters and funk brothers! And keeping with that old school flavour, it will come with a limited edition 7 vinyl pressing alongside the digital single and feature an instrumental version on the b-side with the Horns cutting loose on the solos. Now in their 19th year, The Haggis Horns are still as popular and busy as ever playing clubs and festivals around the UK and internationally and finishing this new album for autumn release. Expect another slab of heavy funk and sweet soul with longtime vocalists John McCallum (Corinne Bailey Rae band) and Lucinda Slim on various featured tracks plus the hip-hop collaborations with Doc Brown. As always, their famous super tight rhythm section holds it down alongside one of the UK’s best horn sections of the last 2 decades whose gig/recording credits include Mark Ronson, Amy Winehouse, Jamiroquai, Martha Reeves & The Vandellas and Lily Allen.